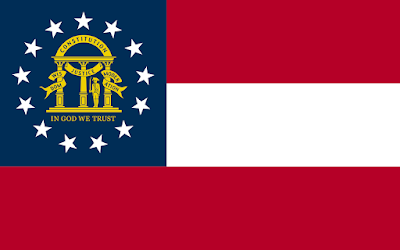 This current version of the flag of Georgia is actually relatively new- it was adopted on May 8th, 2003 and yet still bears the unfortunate name of the 'Georgia Stars and Bars.' Yes, you guessed it: the Confederate States of America still has an unfortunate legacy that's found in the flag of Georgia. (Along with the flag of Mississippi and to some degree, the flag of Alabama.) But, despite that: this is actually a step in the right direction for Georgia, considering that their flag used to look like this. 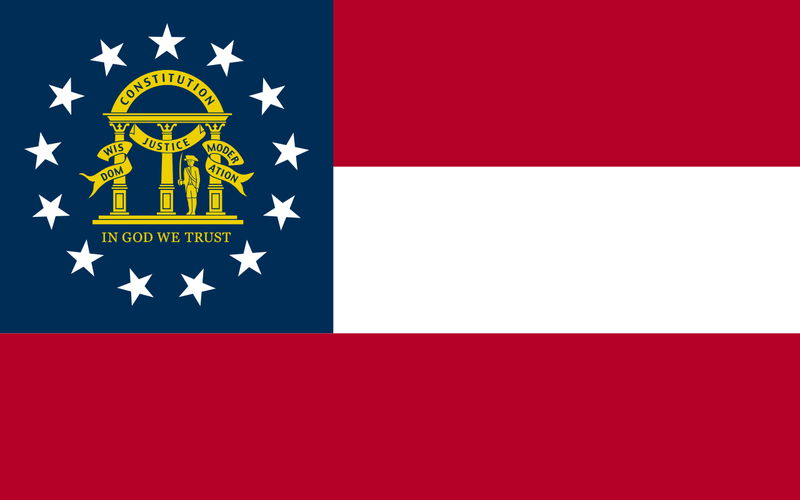 I'm not sure I'm a fan of the current flag either, but I think we can call agree that it at least constitutes a giant step in the right the direction for Georgia. Better than their old flag anyway. But back to the current flag! The ring of thirteen stars symbolizes Georgia as one of the original thirteen colonies. Within the ring, you find the state Coat of Arms in gold. The arch stands for the state Constitution, while the three pillars are the the three branches of government (legislative, executive and judicial.) The state motto of 'Wisdom, Justice and Moderation'* is wrapped around the pillars and the male figure is dressed in colonial attire dating back to the revolution. His sword is drawn to represent the defense of the state's Constitution. And the words, 'In God We Trust' is underneath it all representing the state's 'foundation.' And the overall design with the red, white and red bars is yes, still based on the first national flag of the Confederacy- the Stars and Bars. Another relatively new flag (it was adopted in January of 2004) the flag of the Republic of Georgia is another improvement on both it's Soviet Era flag and it's initial flag after independence (which is honestly kind of 'meh'). The current flag dates back in one form or another the medieval Kingdom of Georgia which was around from the 1000s to the 1400s or so before fracturing. The actual five cross design is believed to be a take on the Jerusalem Cross which was a popular crusader symbol from back in the day as well. After achieving independence from the Soviet Union, a majority of Georgians, backed by the Georgian Orthodox Church rallied around this flag and wanted it restored- the Parliament even passed a bill in 1999 doing just that, but then President Shevardnadze didn't endorse the change. So it's not surprising that the flag was then adopted by the main opposition to Shevardnadze and became a key symbol of the Rose Revolution that ousted him. 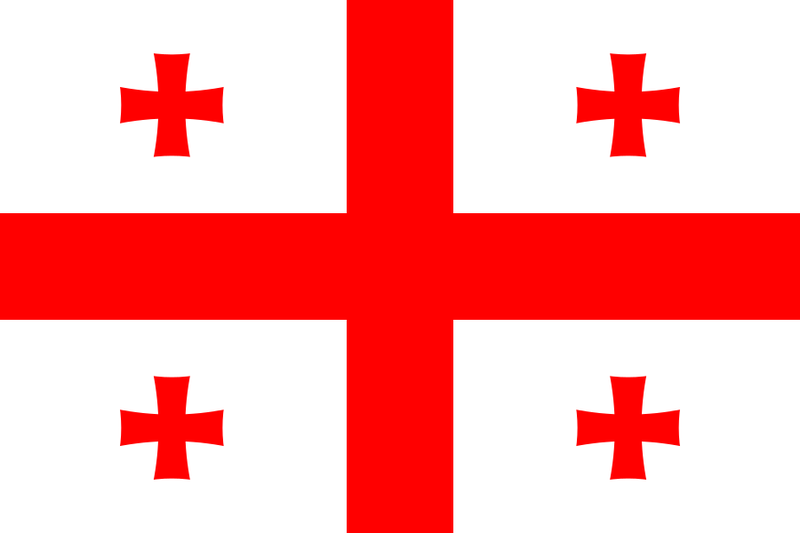 In general, of all the flags of Georgia out there, I probably like the current one the best. It's got deep historical roots that go back centuries. It's part of their national heritage and culture and from a design perspective it has none of the hang-ups that the State of Georgia has and is simple, clean and to the point. Four red crosses in each canton divided by a big red cross on a field of white. Can't get much cleaner than that! So that's our double shot of Georgia! Remember, until next time to keep your flags flying, FREAK or otherwise!